Dan Coleman is a Jog Derbyshire leader with Heanor based group AAJ (All About Jogging). 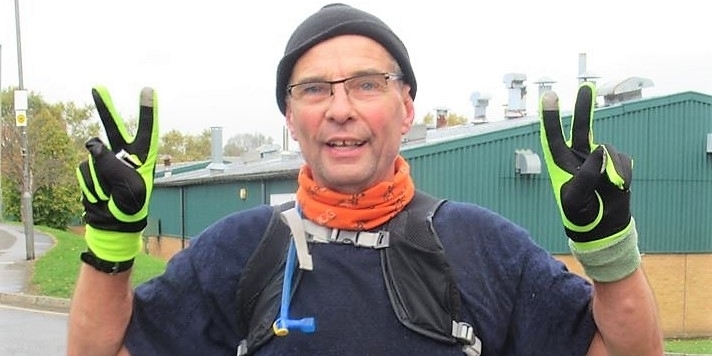 In a special blog for us he tells us about what he’s overcome to take on his first marathon, aged 65 and how the support of his jog group helped him get through it. I started to run again in 2009 after a 15-year absence when my football career ended at 41. I was 18 stone at the time and my wife suggested we lost a little weight before going on holiday. We started to walk, then power walk. On one occasion she wasn’t very well so I went out on my own. I got to two miles and it started to rain so I started jogging back before I got completely soaked. When I was almost home I passed a white van with three young men inside. They were laughing at me and making fat belly gestures which really made me mad. For the next few days I couldn’t get the mental vision out of my head. I thought to myself perhaps they had a point, even though it felt cruel. Over the next three years I joined a Jog Derbyshire group. Karen, the jog leader was lovely and I really felt comfortable. I went from being one of the slowest runners to one of the fastest and when I reached my 60th birthday was encouraged to enter some 10k races. I’d never run a race and felt out of my league, but to my surprise I came second in my age category. My wife’s friend heard about my running and said why don’t you do your UK Athletics LIRF (leader in running fitness) coaching so you can lead your own group. It didn’t take me long to make my mind up and I enrolled onto the course. I did my training in 2014 and started my own Jog Derbyshire group the next month. On that first training session I only had four members and one was myself. In 2016 I had an accident by slipping on wet decking and landing with all my weight on my left knee. This virtually ended my running and almost destroyed me. Even though I kept my spirits up I found it very hard and had lots of low points. After an MRI scan doctors recommended a complete left knee replacement. They also told me not to run further than 10k and not to do too many. It would have been easier to say, ‘let’s call it a day’, but I never missed a training session for my Jog Derbyshire group. I went on my bike which was a little odd but the only way I could keep the group going as the only qualified jog leader. As though this was not enough my lovely Mum (Betty) died from Alzheimer’s. She was such an energetic person who within a few years had turned into someone who couldn’t do anything for herself including speaking or recognising anyone. Being stubborn, old fashioned or just stupid I decided to try creams, sprays and anything possible before going under the knife for my knee replacement. Gradually, the ointments, pain killers and knee supports started to decrease. At the beginning of 2018 it was my 65th birthday and I wanted to do something very special to say a final farewell to my beloved Mum. So what did I decide to do? I decided to run my very first marathon and try to raise some money for The Regional Alzheimer’s Society. When I went to my jog group training session I told a couple what I was planning and to my amazement they asked if they could run with me. I was delighted and more and more wanted to enter the run which was around the perimeter of Shipley Park. The event was on Saturday 27th October and 32 from AAJ ran in the event. Some did 10k, some did a half marathon, some did 20 miles whilst eight of us continued to complete the full marathon in 5 hours 28 mins. Not fast, but that wasn’t the aim. The aim was to get to the finish line and raise plenty of money for my chosen charity which was very close to my heart. The feeling on completion was very emotional with several of us crying. The team spirit to help each other around was amazing, I can’t thank my club members, family and running friends enough for all the effort and donations they put in to help me say a final farewell to Mum. In the end we raised more than £2,000 which was amazing. We’re not just a running club we’re an extended family at AAJ and if anyone is looking to join a great supportive Jog Derbyshire group you’re very welcome to come along. We’ve gone from four to 192 members in just four years and now have three trained running coaches, six co-leaders and eight trained first aiders. I sincerely hope my story helps some elderly, perhaps overweight people or anyone into giving jogging a go. Jog Derbyshire groups are a great place to start we have some amazing people out there just wanting to help you.